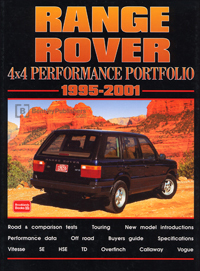 This Range Rover 4x4 Performance Portfolio: 1995-2001 is a collection of 35 original articles compiled from the pages of Autocar, Car, Car South Africa, Car and Driver, Diesel Car, 4x4, Range Rover Owner, Range Rover Monthly, Modern Motor, Motor Trend, Road & Track, and What Car?. The information collected in these reprinted articles includes 12 on & off-road tests, plus specifications, touring and long-term reports. The second generation Range Rovers were conceived before the BMW take-over, as was the agreement to use the BMW engine. Sales were strong and quickly out-sold its predecessor in terms of annual sales. Limited editions and special editions were introduced periodically. From mid 1988 the two V8 engines were re-worked to improve drive ability. A minor facelift in 2000 was the last real change before production ceased in 2001. Neglected vehicles car be very expensive to rectify. This is a book of contemporay road and comparison tests, technical and specification data new model introductions, long term tests, buying second hand.